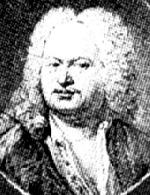 On this site you will find information concerning the life and work of the most famous lutenist of the baroque era, Silvius Leopold Weiss, who was also highly regarded by his contemporaries as a composer. Around the beginning of the 20th century, after almost 200 years of neglect, the work of Weiss began to be rediscovered. Now, most of his solo sonatas -- there are nearly a hundred of them -- are available on CD; and even his ensemble works, which for the most part have survived only in the lute part , have now been reconstructed. As recently as 2004, a sensational finding was made in the archives of the Harrasch family: the discovery of a complete Weiss lute duo and lute trio in manuscript. Weiss’ Christian name can be found indifferently spelled Silvius or Sylvius. It may be because of this engraving that the spelling of Silvius’ Christian name change according to the dictionaries (when his name appeared in them !) and other publications, for it appears in the form of Sylvius and not Silvius, which he used to sign his letters. The bottom line is that both spellings are correct. The y ; was the modern European norm for Sylain, Sylvio, etc. The i would fit in the logic of the Latin suffix -us , which was an affectation then fashionable among 18th century German artists. Weiss’ two Christian names thus formulated are similar, only inverted, to those of Wolfgang Amadeus, for instance. He actually signed his letters Silvius Leopoldus Weiss and called one of his sons (he had 7 children) Adolf Faustinus - who incidentally took after his father as lute player at the court of Dresden.